There is no such word as 'sighthound'. It's a lazy casual invention and an inaccurate one. 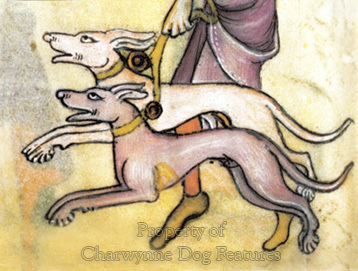 The coursing dogs do not hunt by sight; they hunt by speed - they are 'levriers' or 'windhunden'. Similarly, the scenthounds, so called, do not hunt just by scent but by scent, sight and most importantly, by stamina; they exhaust their quarry. Cursorial hounds are light, leggy and lethal! An old sportsman once told me of his blind Whippet that seemed to be able to run with his other dogs with remarkable if understandably limited accomplishment. Powerful eyesight will always be a huge advantage to any prey-driven hound but it's one thing to spot game, quite another to catch it. The wild cat family range from those hunting mainly by speed, like the cheetah and the lynx, to those hunting by stealth and ambush, like the lions, tigers, leopards and jaguars. The wild animals hunting in packs were much more dog-like, as wolves, coyotes and painted dogs illustrate. The heavier members of the cat family have to be lightning-fast over short distances - after first detecting their prey by a combination of sight and scent. The powerful hunting mastiffs, as used in the Assyrian hunt, were utilised in a comparable way, as the ancient tablets reveal. Hoofed game have to be hunted by even faster hounds, bred to exceed their pace and skilled at bringing them down. If the coursers could achieve this then the 'seizers' had to - with the build to permit 'close-quarter battle'. 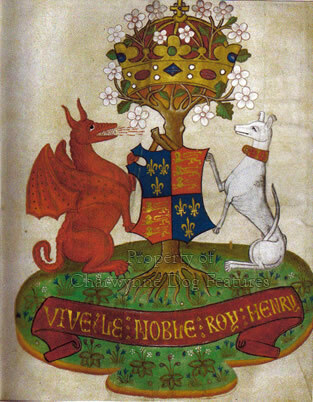 Coursing dogs have been revered by primitive man, medieval man and modern man; Tsar, serf, squire and sheikh each valued their canine sprinters, with Henry VII having a Greyhound on his royal coat of arms. The story of the ‘canine cursorials’ – dogs having limbs adapted for running, that find their prey in open country and hunt it using great pace, often over considerable distances, is very much an historic journey. It is no surprise therefore to find their most effective use in deserts, on steppes and prairies or level rocky terrain, from Syria and Iraq to Afghanistan and Russia. They were valued by hunters from ancient Egypt and classical Greece, then in turn, by widely-separated Russian, Arabian and western noblemen. Arrian, the Greek historian, wrote in 124AD: “I myself have bred a hound whose eyes are the greyest of grey. A swift, hard-working, courageous, sound-footed dog, and she proves a match at any time for four hares. 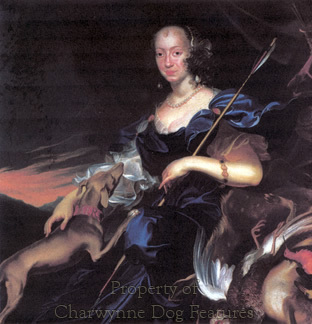 She is, moreover, most gentle and kindly-affectioned…” That is a timeless description of the coursers' function and nature. 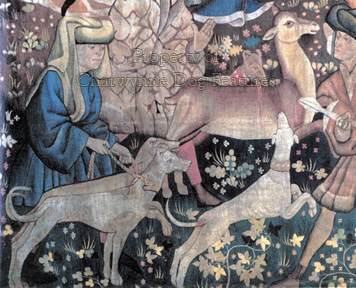 The Devonshire Hunting Tapestries of the early 15th century, in the collections of the Victoria and Albert Museum, vividly display the sheer pageantry of the hunting scenes of those times, featuring hounds and hawks – with the hounds mainly consisting of the Greyhound type, illustrating the high value in the hunting field of these hounds at that time. 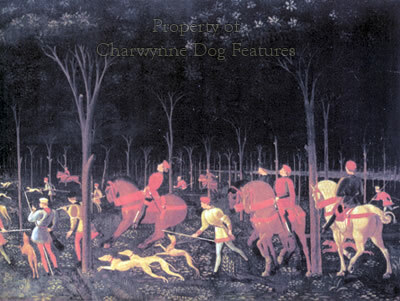 Such scenes typified the hunting scene right across Europe and western Asia in the 15th century - the style of the pageantry may have differed but the significant employment of coursing dogs and their immense value to man at that time is evident. The tapestries indicate the wide range of quarry pursued by such hounds. 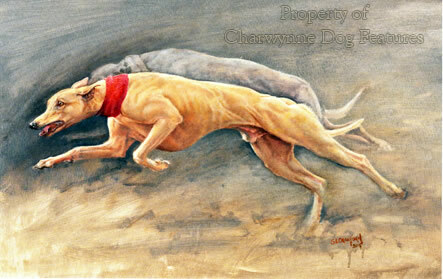 They illustrate too the close companionship of man and dog in the hunt. It is not surprising that, unlike some types of dog at the mercy of human whim, the coursers have retained their timeless type. 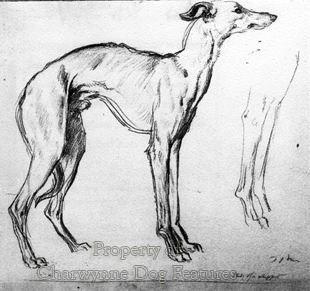 An immediate similarity can be detected between, say, Durer’s sketch of a small coursing dog of around 1500 and Augustus John’s portrayal of a Whippet in 1948. 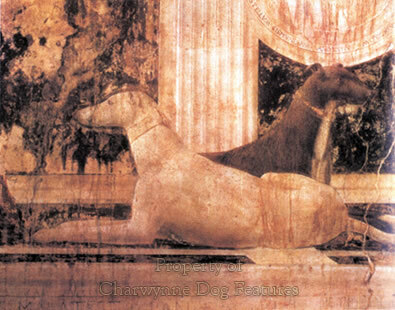 The hounds depicted in Paolo Uccello’s Hunt in the Forest of the mid-1400s and in Piero della Francesca’s Portrait of Sigismondo Malatesta of 1451 could have featured in Franz Luycx’s portrayal of the Kaiserin Eleonora Gonzaga of 1651. The anatomy of the courser has been shaped by function and decided by function. Changes in hunting itself may have lessened the canine sprinter's role but speed, if not the same level of agility, is still in demand on the track. 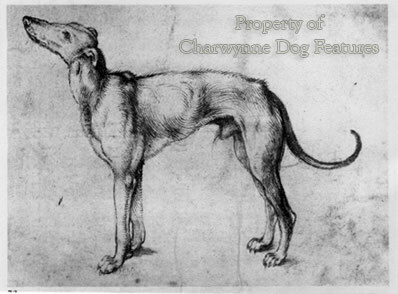 In his Of English Dogs published in 1576, Dr Caius mentions two types of hunting dogs: ‘One which rouseth the beast, and continueth the chase. Another which springeth the bird, and bewrayeth the flight by pursuit.’ He subdivided such hunting dogs into five functional categories: ‘The first in perfect smelling, the second in quick spying, the third in swiftness and quickness, the fourth in smelling and nimbleness and the fifth in subtlety and deceitfulness’. The athleticism of the coursing breeds embraces sprinting, hurdling and middle-distance running; they are canine athletes that also clear obstacles and turn at great speed, sometimes facing formidably-fanged or dangerously-antlered quarry. Such talented hounds thoroughly merit our admiration and totally deserve our patronage in these difficult days for hunting dogs. Banning coursing large and small game with hounds has gradually spread throughout mainland Europe: in France in 1844, in Germany in 1848 and in Holland in 1924, denying both noble and working class sportsmen their chance to fill the family's cooking pot. Before such law-changes, northern Europe had a distinguished heritage of hunting with coursers: levriers in France, windhunden in Germany and the rough and smooth-coated Friese Windhond of the Netherlands, for example. Sadly, we lost not just the sport but the hounds too.